Here we will be covering 4 free online spider diagram maker websites. Spider diagram or spider chart is a simple graphical method to represent multivariate data in two-dimensions. In a spider diagram, the multiple variables are represented on the axes with a common starting point in a spider-like shape. Spider diagrams display complex topics on a single page by using a branching spatial organization. In this article, I will cover 4 online diagram editors to easily make spider diagrams online. 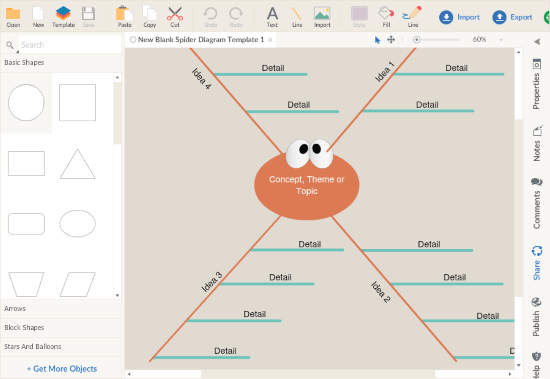 In these editors, you can draw the spider diagrams using basic shapes and drawing tools. You can make your diagram colorful and add images as well. And once your diagram is complete, you can download it to your computer and use it for your intended purpose. 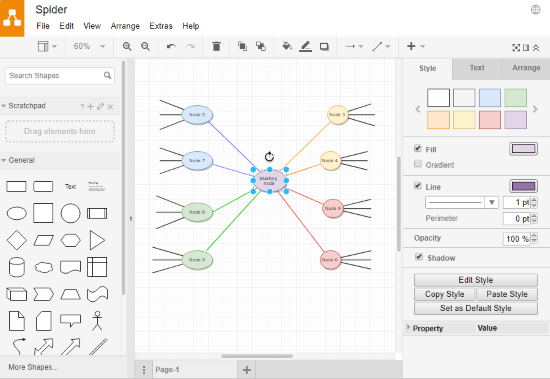 Draw.io is a feature-packed online diagramming tool where you can draw almost any type of diagrams. This tool is very simple to use and packs a handful of diagram customization options as well. You can use this to make spider diagrams online. To do so, you can use the basic shapes from the shape library to represent multiple variables and connect them all to a common starting point/shape in the center. If you don’t wanna use the shapes for the variables, you can use the Line tool to draw lines as nodes from the common center and represent your variables on them. Similarly, you can also add further branches if required. In this tool, you can pick a color for all the shapes and lines you draw. You can change their width, opacity and add shadow as well. In case of text, you can choose the desired font face for the text, change its size and color. You can also import images and add them to the diagram. After making the diagram here, this tool lets you export it to your computer or to the cloud platform right from the editor. You can export the diagram to any of those locations as a PNG, JPG, SVG, PDF, XML, HTML, or VSDX file. Give this online spider diagram maker a try here. The next website to make spider diagram on this list is LucidChart. It is a powerful online diagram editor to create various types of charts and diagrams online. This editor has a few spider chart templates which you can use to make your spider diagram here. While creating a new diagram, you can select any of these templates and add them to the editor where you can customize them as per your data. If you don’t find a suitable template for your data, you can make a diagram from scratch using the basic shapes and Line tool. You can drag & drop shapes to the editor from the shape toolbar. In the editor, you can customize the shapes as per your needs, add text and fill with color. You can also import images if you want to use them instead of text or along with the text. In the end, you can export your spider diagram as a JPG, PNG, PDF, SVG, or Visio file. With this tool, you can also generate public/private shareable URL to your diagram and share your diagram with others without downloading. This tool can also generate an HTML code which you can use to embed the diagram on a webpage. You can try this online spider diagram maker here. Creately is yet another powerful online diagramming tool to make various types of diagrams. This tool also has a few templates for spider diagrams which you can use to make your diagram. Here, you can make a graphical spider diagram by importing images or, stick with the regular text only diagram. Similar to other editors, you can customize the appearance of the diagram by picking colors for the nodes and shapes. You can cut/copy-paste an existing node and shape to save time and customize it to change its appearance and label. This way, you can make a visually appealing spider diagram with this editor. Once your diagram is complete, you can download it as a PNG or JPG file. In this editor, you can also add online collaborators to collaborate on a diagram. To do that, you can generate an online collaboration URL here and share it with others to invite them. Try this online spider chart maker here. RealTimeBoard is an online whiteboard where you can make designs and collaborate with others. As a free user, you are allowed to create up to three designs here and you can add up to 3 collaborators. With it’s simple to use drawing tools, you can easily make a spider diagram with this tool. To make the spider diagram, you can add a shape from its shape library as a common source. Then, you can plot lines as nodes to the source and label them with your diagram variables. You can use different colors for different variable nodes to make the diagram colorful and vibrant. After making the diagram here, you can export it as JPG, PNG, SVG, or PDF file to your computer. 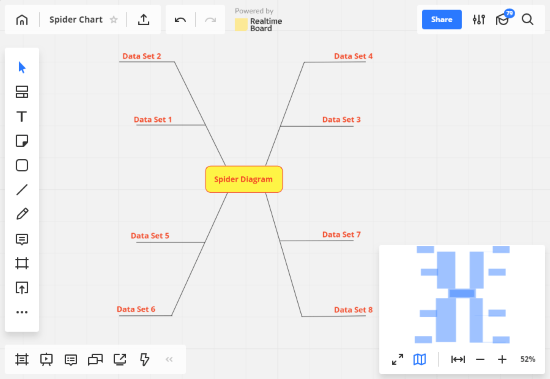 Make spider diagram online with RealTimeBoard here. 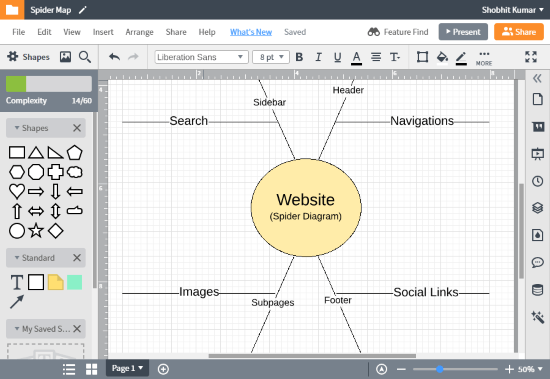 Making a spider diagram is simple with these online diagramming tools. You can use any of these tools to draw your spider diagram. LucidChart and Creately have a few easily customizable spider diagram templates to get you started. Check them out yourself and share your opinion with us in the comments.